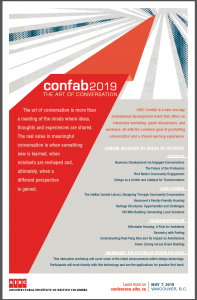 Home / News / AIBC Happenings / AIBC Confab 2019 Registration Opens February 19! AIBC Confab will feature an interactive workshop: “The Future of Design Delivery”. This workshop will cover many of the new advancements within design technology and speak to the benefits of the advancements for practice. Cloud based collaboration and client commentary management will be additional features within the course to discuss the best practices for meaningful dialogue using simple technology. Attendees will gain knowledge to democratize seemingly complex technology and begin the road to structured data, allowing for architecture projects to be effectively communicated in a wide array of mediums. For detailed information and to view the lineup of speakers, please visit the 2019 AIBC Confab website.